Blake is a guest author from You Design It. He tries to bring the knowledge to help you design t-shirts. 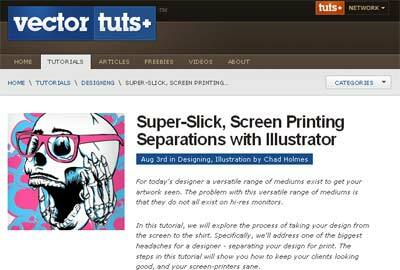 Vectortuts just released a new tutorial from Chad Holmes about creating color separations in Illustrator for use with screen printed t-shirt designs. It’s an excellent article and goes into an amazing amount of details taking the reader from selecting the skull, adding strokes and layers and then finally doing all the color separation for a crisp, clean screen printed t-shirt. 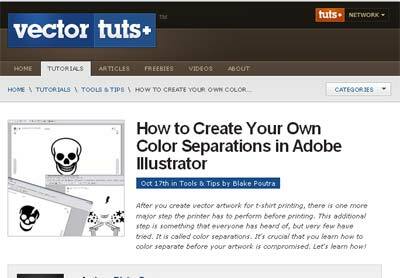 A while back I authored a similar article on Vectortuts on the process of color separations in Illustrator for printing to film. IMHO, both will take the reader on an easy to understand process of color separation for their design. The main difference between the two is that Chad went into much more detail and encompassed more steps in the design process whereas I focused primarily on the color separation aspect by itself. For example Steps 7-10 of Chad’s tutorial feature the step of adding black outlines and other detail to the skull while steps 17-22 feature information relating to reducing the number of colors in the design for cost and production concerns. These are great additional details and are sure to help out tons of people who face these challenges and wonder what to do next. I think they both have a place in the tutorial world because they bring different perspectives showing “more than one way to skin a cat”. I hope you can learn from both of these and gain a new some new tools for your design toolbox.